How do you top a trip to sun studios in Memphis, TN? The hotel has 20 "themed" rooms. Some how the symeast group seems to have been placed in the majority of them. I am in one of the 20 for the next 2 nights, switching to another theme on Thursday thanks to the front desk staff. Should make for an interesting week. 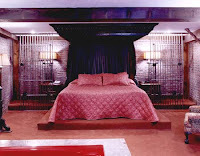 I think we'll be doing room tours later so everyone can take a look at the 1970's themed decor.